Villa Le Prata was built in 1860 by Count De’ Vecchi as a hunting lodge. Afterwards it became the countryside home for the bishop of Moltalcino. In 1980 Massimo Losappio, chief surgeon of Montalcino hospital and his wife Marialuce, a philosophy teacher, purchased the Villa and, driven by their passion for wine and the pleasure to share with their friends the fruits of this generous land, planted the first hectare of vineyard near the Villa. Later on, with the absolute desire to enclose in a single bottle the most authentic atmosphere of the Montalcino terroir, two other vineyards were planted in the area of Castelnuovo dell’Abate. These three vineyards, located in three different areas, make the perfect combination of elegance, aromas conveyed by altitude, and the body and structure of the land south of Montalcino. Villa Le Prata is a very small estate run by the family members who work with passion to obtain exclusively fine wines. 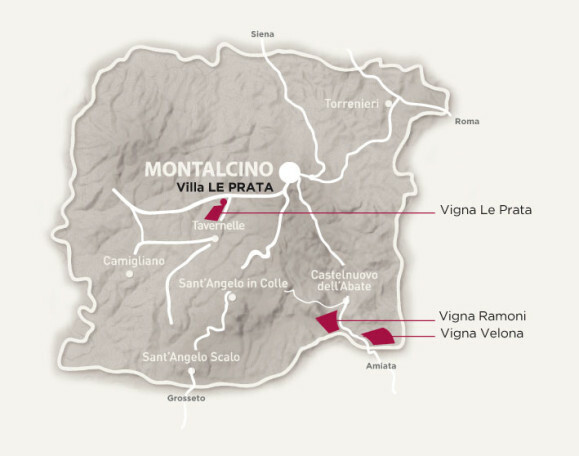 Le Prata – one hectare located near the Villa, nestled between century-old chestnut and wild cherry trees in the North/East area of Montalcino, at 510 metres of altitude. The grapes obtained from this vineyard give the wines their delicate aromas and brilliant elegance. Planted in 1987 using the spurred cordon training system, it has East-Western exposure. Soil: Clayey, sandy, of mixed consistency. Ramoni – one hectare is located south of Montalcino, just below the town of Castenuovo dell’Abate, at 210 metres of altitude. Planted in 2000 using the spurred cordon training system, it has East-West exposure. Soil: Clayey, sandy, of mixed consistency, with a good content of silt. Velona – one hectare located south of Montalcino, just below the Velona Castle, at 250 metres of altitude. Planted in 1997 using the spurred cordon training system, it has East-West exposure.